Despite the volumes of analysis, artspeak and criticism that accompany the long history of art, it seems that each generation is compelled to coin new definitions and ‘movements’ for their own artistic expression or at least redefine and clarify existing terms. From my own experience, the question of what makes art ‘Jewish’ or what is ‘Jewish art’ was raised in the early 80’s during a solo exhibition. In writing his review, the reporter for a local newspaper asked me to define it for his broader audience. He wanted to know whether art was deemed ‘Jewish’ because of its subject matter or because it was made by a Jewish artist. At that moment, I couldn’t say, but I did know that it had to be some combination of both. Only a few days later on December 12, 1982, I’d finished reading Chaim Potok’s 1972 book, My Name Is Asher Lev when an answer came to me that I recorded in one of my journals: ‘Jewish art, regardless of its creator, is what emerges when one is inspired to create art whose imagery is specific to Jewish culture, history, tradition and/or ritual.’ Given my penchant for illustration, my love of stories and growing interest in a faith I was born to but did not deeply observe, that realization would become the touchstone for much of the work I would produce in the ensuing three decades. When the Baal Shem Tov had a difficult task before him that involved the safety and welfare of the Jewish community, he would go to a certain place in the woods, light a fire and meditate in prayer. Afterwards, what he had set out to accomplish was done. A generation later, when the Maggid**of Mezhyrich was faced with a similar task, he would go to the same place in the woods and say: “We can no longer light the fire, but we can still speak the prayers.” And what he prayed for became reality. In a succeeding generation, Rabbi Moshe Leib of Sassov too, was faced with the difficult task of ensuring the well-being of the Jewish community. Returning to the woods where his ancestors had prayed, he said: “We can no longer light a fire, nor do we know the secret meditations belonging to the prayers, but we do know this place in the woods to which it belongs; that must be sufficient.” And sufficient it was. And the story which he told verified in effect the actions of the previous three sages. All of which persuades me to conclude that as I continue to interpret the stories that illuminate Jewish history, mysteries and seemingly mundane wisdom, I may be doing my small part to pay forward that vibrant tapestry of ideas into the continuum of who we were, who we are and who we may yet be. *’Besht'(בעש”ט) is the acronym for Baal Shem Tov. Though later attributed to several of his descendants and disciples, this honorific was originally attributed to the 17th century rabbi Yisroel(Israel)ben Eliezer who is considered to be the founder of Hasidic Judaism, a movement based on his own spiritual and mystical insights and practices. 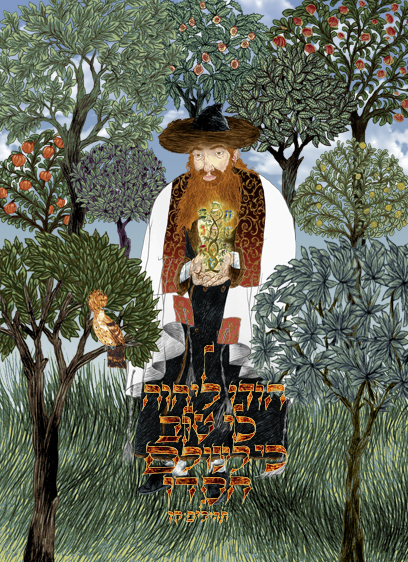 For further information, Wikipedia offers a lengthier biography and explanation of the Besht’s philosophies at:http://en.wikipedia.org/wiki/Baal_Shem_Tov. **an Eastern European Jewish itinerant preacher of Torah and narrator of religious stories. This entry was posted on April 30, 2012 at 8:38 AM and is filed under Imaginarius Updates. You can follow any responses to this entry through the RSS 2.0 feed. You can leave a response, or trackback from your own site. Well said Ilene. Your words and images are indeed important thread in the continuum of Jewish visual culture.